The Half Ironman Intermediate program is for the triathlete that wants to achieve performance goals in addition to a strong race day performance. Program Prerequisites: To successfully start this program, it is recommended that your current training regimen consists of 5 training hours per week. If your current weekly training totals are not at 5 hours, it is recommended you complete 3 to 4 weeks of consistent moderate aerobic exercise in order to be properly prepared to begin this program. Training hours per week: Max hours of 12 and Minimum of 6 hours. Max and minimum training hours are dependent on your training pace. The average is 10 weekly training hours. Scaling workouts: Any workout can be scaled up or down. Scaling up (making harder): extend a workout duration by extending the warm up, main set or cool down. You can also scale up by increasing the intensity from Zone 2 to Zone 3, or Zone 3 to Zone 4. You can also decrease the rest interval. Note: be mindful of how often you scale up and allow ample recovery time when doing so. Be careful to not overdo it. Scaling down (making easier): decrease duration by decreasing the warm up, main set or cool down. You can also scale down by decreasing the intensity from Zone 3 to Zone 2 and Zone 4 to Zone 3. You can also increase the rest interval as needed. Race Prep Weeks: Weeks 7, 9 and 11 are Race Prep Weeks. Expect race simulated workouts. Practice race pacing strategy, as well as your nutrition strategy. Assessments: It is recommended you assess anytime between week 1 through week 5, and anytime during week 9 through 11. Additionally, multiple swim, bike and run workouts are be repeated in the program. The purpose for repeating workouts: adequately tracking progress throughout the program and perfecting the workout goals. Training Zones: Each workout has specific zones to hit to achieve workout goals. These zones are determined based on completion of an assessment. If you have not yet done an assessment, you can follow the attached charts for Rate of Perceived Exertion. Within 10 minutes of finishing the bike, begin the run. 10 minutes in an easy gear. 4 x (60 seconds at Zone 3, FTP 76-90% w/ 30 seconds recovery at Zone 1). At the completion of the run ,do 2 to 4 x 100m accelerations building up to Zone 4, with 30 seconds Zone 1 between each acceleration. Begin the ride at Zone 2. FTP of 56 to 75%. 2 x 15 minute tempo intervals, Zone 3 (FTP 76%-90%). Recovery between each interval is Zone 1 for 5 minutes. Finish the ride at Zone 2. FTP of 56 to 75%. After 10 minutes of Zone 1, 2, do 4 x 100m accelerations with 30 seconds walk/jog recovery between each acceleration. Complete the remainder of the run at steady Zone 2. WU: 300 choice of free, kick, drills. 1600m/yd progressive swim at your discretion. Begin at Zone 2 pace and finish at Zone 4. Swim at least 400m/yd in Zone 3 and at least 100m/yd in Zone 4. 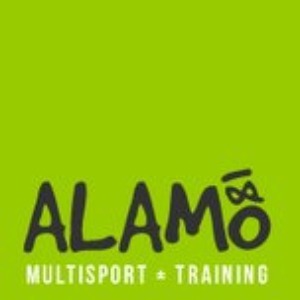 Since 2011, Alamo 180 has specialized in coaching nearly a thousand Sprint & Olympic Half Ironman, and Full Ironman finishes. These numbers continue to grow year after year! We know how to expertly develop training programs that work and allow athletes to achieve their triathlon goals! Our proven programs get athletes to the start line healthy and strong, and to the finish line with a smile on their face.